How vividly I recall my great-uncle whose name I carry forward. We both became doctors, but in my case of medicine and surgery, and in the case of my great-uncle of Chemistry. My uncle was thus the proper doctor, well at least technically speaking, gaining his PhD in Technical Chemistry in 1924. Dr Peter Ferguson Gordon was the brother of Henry, the grandfather that I never knew. Peter was born in Newarthill on the 5th October 1893, the first of the seven children of John Gordon, Colliery Manager and his wife Mary Cowan Jamieson. Peter was the first of six boys, and when his sister Mabel came along in 1908 he was most worried that his ‘Mither could’nae dress a girl! Peter’s father, John Gordon (1864-1922) was a strict disciplinarian and extolled the virtues of hard study. The irony is that his younger brother was dux of Forres Academy and the Gold Medallist, but ditched academia to retain family tradition in farming. This brother – ‘Peter Gordon of Milnathort’ thus had the intellectual distinction of his nephew Peter, but not the success. Genes ran pure, as their appearance was uncannily identical: uncle and nephew. Milnathort Peter stands exemplar in a Gordon tradition. When his first wife ‘Stewart’ of 15 years of marriage died at the end of October 1912 after suffering the ravages of 18 months of pulmonary tuberculosis, Peter employed a succession of ‘nine housekeepers’ before deciding to marry the last! Yes, less than ten months after the loss of his wife, he had re-married the Housekeeper. It is an interesting fact that the Gordon men were vulnerable to their housekeepers. Or perhaps that sentiment should be the other way around! Milnathort Peter’s ‘uncle William’ married his housekeeper. His nephew Henry married his. Time though to return to the subject of this chapter – great-uncle Peter. He was probably always a bit different, lovably eccentric – a tall lean, easy-going genius. He loved to recall family stories. Like the time he and his brothers decided they wanted to play cricket. They had no stumps fit for the purpose so decided to chop their father’s walking stick into three. When their mother found out she was aghast – they had used her husband’s special cane – it had been presented to him by his Employers Edinburgh Collieries Company Ltd and had an engraved brass ring at its head. Peter went on to become Head of the Chemistry Department (including Pharmacy and Metallurgy), at the Technical College, Coatbridge. In 1937 aged 46 years he applied for a Professorship at Heriot Watt University, Edinburgh. He was unsuccessful despite preparing a privately printed ‘candidature’ of some thirty odd pages. It forms a most impressive curriculum vitae, outlining his two degrees at Edinburgh and Glasgow universities and a wealth of experience in academic and industrial chemistry. By his testimonials we can see that he was a hard-working, valued colleague, much liked by all his students. But more than this he was a genius empowered by his own original thought. That is a superlative that should not be used lightly, but I have no fear that it has been improperly or unjustifiably used here. 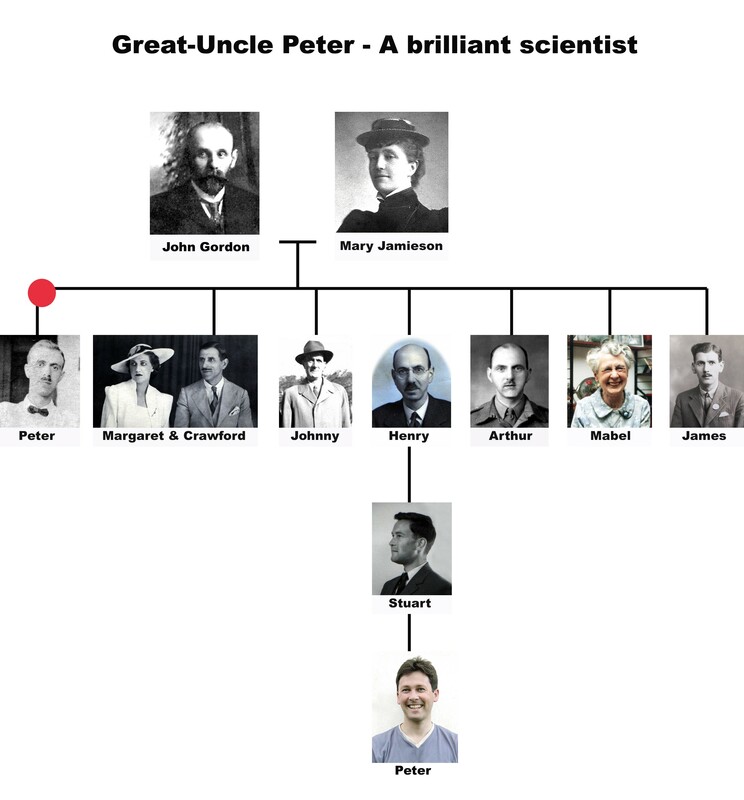 It is worth pointing out that Uncle Peter also married a genius. His wife Margaret Lees was a Gold Medallist in her own right, and went on to graduate as Master of Arts, and all at a time before womens lib. Great-uncle Peter used to tell a somewhat grisly story about his days working in Industrial Chemistry. It was about a foreman who had to walk across a tank of acid to get to the temperature controls. This was long before proper health and safety regulations and to traverse the tank he had ‘to walk’ a wobbly plank. Not surprisingly one day his foot missed its step and he fell into the tank. All they found, Great-uncle Peter delicately rehearsed, was his enamel teeth and fillings! Great-Uncle Peter used to come and visit our family at Bonaly. Every visit he would drop 50 pence into my hand. 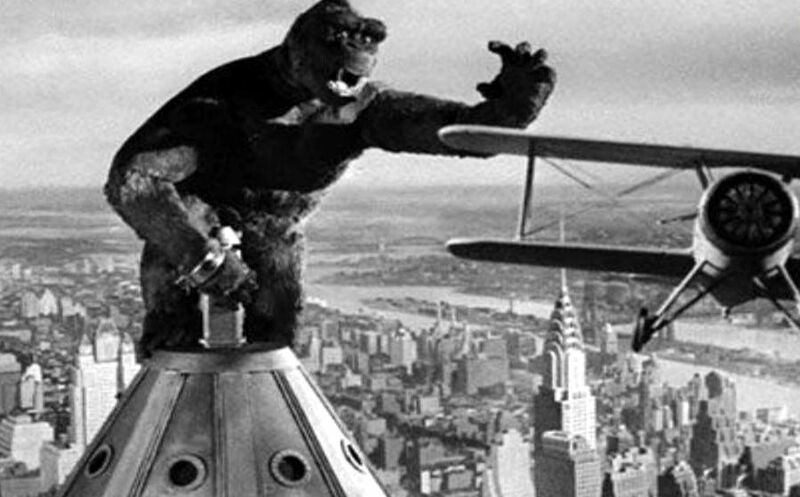 On one occasion King Kong the 1933 movie was on television. I was captivated by the greatest fantasy film I had ever seen. The musical score by Steiner captured the beating heart. Yet it was the anguished cries of Kong wrapped around the Empire States building and the aggression of man that really really moved little me to tears. Great-Uncle Peter could see how enthralled his young grand-nephew was. That next week came in the post a comic book all about King Kong. I was thrilled and have never forgotten that act of kindness. It was around this time that Great-uncle Peter described how he had been there at the very birth of television. John Logie Baird had for years been working on developing a ‘Televisor’ which had been a dream of many scientists for many decades. His first crude apparatus sat on a washstand. The base of his motor was a tea chest, a biscuit tin housed the projection lamp, scanning discs were cut from cardboard, and he also utilised four-penny cycle lenses. Scrap-wood, darning needles, string, and sealing wax held the apparatus together. 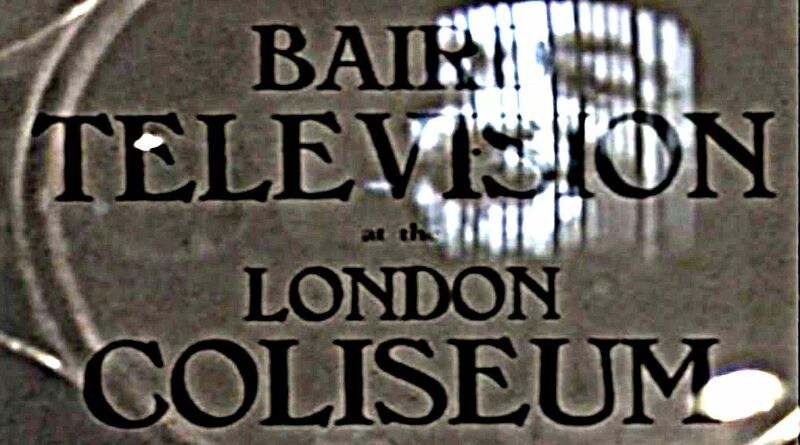 Almost eleven years to the day after graduating with an electrical engineering diploma from the Royal Technical College in Glasgow, John Logie Baird first achieved a recognisable television image. In his autobiography, Baird describes this historic occasion. 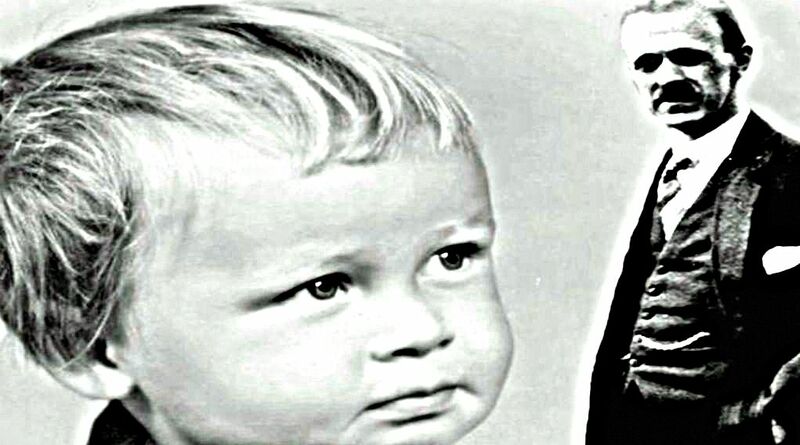 After paying Taynton two shillings and sixpence to stay in position, Baird finally saw a human face recognisably reproduced on his apparatus. Baird waited four months, until 26 January 1926, before demonstrating his achievement to the Royal Institute and a reporter from The Times newspaper. In that audience of fifty scientists was Great Uncle Peter. And that, as they say, was how Peter Gordon was at the birth of television. In his later years uncle Peter never used to go to bed. He sat up in his chair with his woolen finger-mittens and a generous dram in his hands and dreamt of a blazing career in science. It was Great-uncle Peter, who spoke at my christening. He was never succinct, and according to the my father, lurched-off on long tangents, but did take pride in explaining how generation after generation, from Abergeldy down, had alternated in the Christian names ‘Peter’ and ‘John.’ Perhaps there was more to that fate than I had ever realized. exuding a delicate aroma of fish and chips. a house of cards that never fell? ribbon on a long gold clasp. They too belonged to the magic time. as it pounded across the Tay Bridge. His final suspension of disbelief.